Cash has been a growing force in the Sacramento market, while FHA loans have been losing power. Anyone in the trenches of real estate knows this because of how difficult it is to get into contract right now, but it’s telling to see the data actually back it up. When looking at stats from this past year in particular, we see this trend: More cash deals equals less FHA loans. I’ve still been doing a fair share of FHA appraisals for my lender clients, but I’ve noticed my workload has had far more conventional appraisals lately. This could be just me of course because of the type of business my lender clients are attracting, but I think it’s in part to the shifting market too. Unemployment Rates: By the way, another trend to pay attention when sifting through real estate data is the unemployment rate. 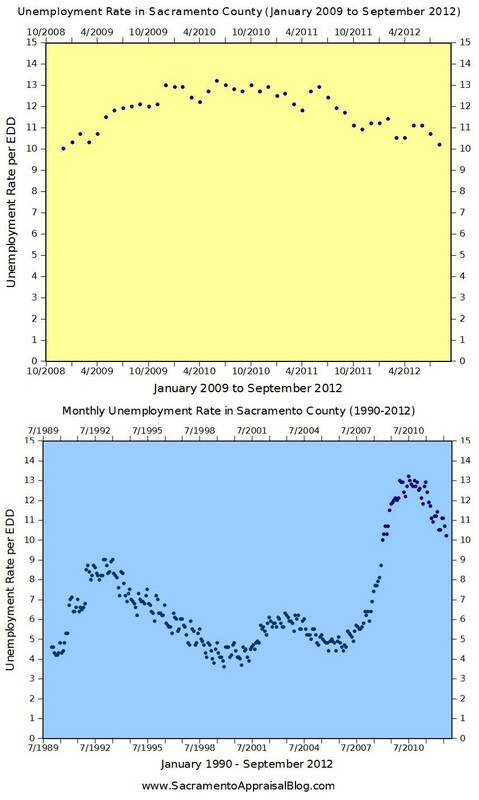 Click on the thumbnail image on the side to see the trend of unemployment in Sacramento County from January 1990 through September 2012. Feel free to use the image on your own blog or website too (please use according to my sharing policy). If you need the image split in two or resized, let me know. Questions: Where do you see this trend going in 2013? If you are an agent, have you been accepting FHA offers lately? Why? Why not? How has it been for FHA buyers competing with cash and conventional offers lately?